Utilization: Guard, defense and dissuasion. Section 2.1. 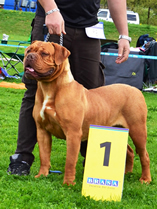 (Mastiff type) Without working trial. 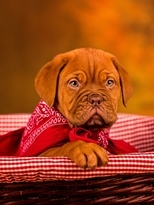 Brief Historical Summary: The Dogue de Bordeaux is one of the most ancient French breeds, probably a descendant of the Alans and, in particular, the alan vautre of which Gaston PHEBUS (or FEBUS), Count of Foix, said in the 14th century, in his Livre de Chasse that " he holds his bite stronger than three sight-hounds ". The word " dogue " first appeared at the end of the 14th century. In the middle of the 19th century these ancient dogues were hardly renowned outside the region of Aquitaine. They were used for hunting large animals such as boar, for fighting (often codified), for the guarding of houses and cattle and in the service of butchers. In 1863 the first French dog show took place in Paris in the Jardin d'Acclimatation. The Dogues de Bordeaux were entered under their present name. There have been different types : the Toulouse type, the Paris type and the Bordeaux type, which is the origin of today's dogue. The breed, which had suffered greatly during the two world wars, to the point of being threatened with extinction after the second world war, got off to a fresh start in the 60's. General Appearance: Typical concave lined brachycephalic molossoid. 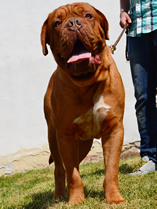 The Dogue de Bordeaux is a very powerful dog, with a very muscular body yet retaining a harmonious general outline. He is built rather close to the ground, the distance sternum-ground being slightly less than the depth of the chest. Stocky, athletic, imposing, he has a very dissua-sive aspect. Important Proportions: The length of the body, measured from the point of the shoulder to the point of the buttock, is superior to the height at the withers, in the proportion of 11/10. The depth of the chest is more than half the height at the withers. The maximum length of the muzzle is equal to one third of the length of the head. The minimum length of the muzzle is equal to one quarter of the length of the head. In the male, the perimeter of the skull corresponds more or less to the height at the withers. 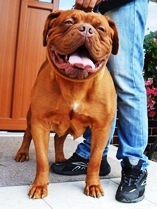 Behaviour / Temperament: An ancient fighting dog, the Dogue de Bordeaux is gifted for guarding, which he assumes with vigilance and great courage but without aggressiveness. A good companion, very attached to his master and very affectionate. Calm, balanced with a high stimulus threshold. The male normally has a dominant character. Head: Voluminous, angular, broad, rather short, trapezoid when viewed from above and in front.